Irregular periods are among the most common of all menopause symptoms and one of the first indications that a woman is approaching infertility. While the exact symptoms of irregular periods can vary from woman to woman, almost every woman will experience irregular periods for the 3 – 10 years preceding her final period. In fact, only 10% of women reach menopause without experiencing irregular periods. Read on to learn more about the symptoms of irregular periods and how to treat them. What Are the Symptoms of Irregular Periods? It can be hard to define the symptoms of an irregular period, as every woman's cycle is unique to her. In general, though, any menstrual experience outside of a woman's monthly norm is classified as irregular. Largely, irregularities might include shifts in the menstrual cycle pattern, duration, or flow. If a woman experiences irregular bleeding between periods and is aged 40 – 50, then the phenomenon may be a sign that she is going through perimenopause, the stage where the body prepares for the menopausal transition. During perimenopause, irregularities include short and long periods or lighter and heavier bleeding. While defining a regular period can be just as difficult as defining an irregular one, generally, an average period consists of a five-day bleeding cycle. Average blood loss is expected to be anywhere between two and eight tablespoons, and women can normally expect to be period-free for anywhere between 16 and 30 days. Changes to a woman's typical menstrual cycle that continue beyond several months and involve abnormal bleeding or irregular cycle lengths should be considered as symptoms of irregular periods. For women between the ages of 45 and 55, fluctuating hormones are the most likely cause of irregular periods. Unfortunately, this is a natural consequence of the body preparing for infertility by producing fewer hormones. Generally, the closer a woman is to menopause, the more likely she is to be affected by hormone fluctuations. Treating the symptoms of irregular periods can be problematic, but not impossible. Below are some of the most effective actions a woman can take to balance her hormones, and in doing so, reduce the occurrence of irregular periods. Apply a heat pad to soothe cramps. Advisable only in severe cases, medications such as HRT can replace lost estrogen and thus reduce menopause symptoms. However, doctors today are reluctant to prescribe it because of the associated health risks. Hutchinson, Susan M.D. "The Stages of a Woman's Life: Menstruation, Pregnancy, Nursing, Perimenopause, Menopause". November 2007. Q&A: I Have Irregular Periods, What Should I Do? 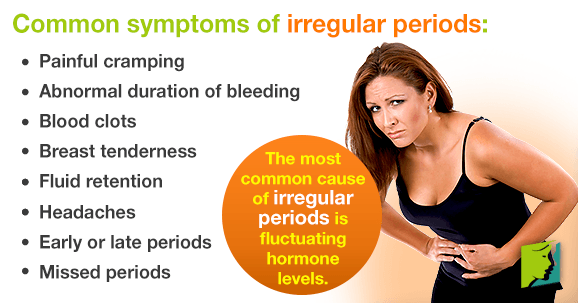 Irregular periods are usually frequent or infrequent. Keep reading below to answer all your questions about irregular periods. Although irregular periods are associated with menopause, they can be caused by other lifestyle habits and medical conditions, such as a thyroid disorder. Irregular periods are usually not a concern, but click here for more info.